The Wanderer Trio is celebrating its 25th anniversary in 2012. Acclaimed for its extraordinarily sensitive style, almost telepathic understanding of each other and technical mastery, the Trio Wanderer is one of the world’s foremost chamber ensembles. 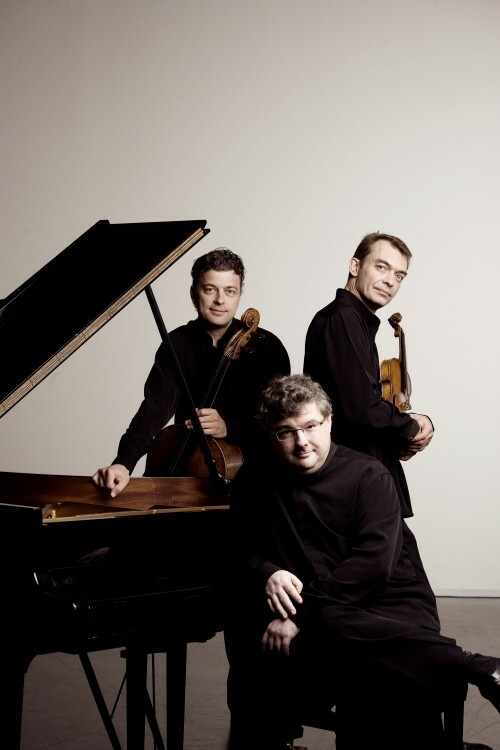 Established at the Paris Conservatory in 1987, the Trio has studied with grand masters such as Jean-Claude Pennetier, Jean Hubeau, and Menahem Pressler of the Beaux-Arts Trio and members of the Amadeus Quartet. The ensemble won the ARD International Music Competition in Munich in 1988 and the Fischoff Chamber Music Competition in the USA in 1990. From 1988 to 1990 they took master classes in chamber music at the Festival of La Roque d’Anthéron – classes which they now teach. They have also performed at major festivals such as Edinburgh, Montreux, Schleswig Holstein, Schwetzinger Festspiele, Rheungau Musiksommer and Osaka. They have also been billed on stages of opera houses, including the Théâtre des Champs Elysées, Milan’s Teatro alla Scala, the Tonhalle in Zurich, Rio de Janeiro’s Teatro Municipal and Tokyo’s Kioi Hall. Trio Wanderer have also made a name in performance of concerts for two and three instruments, playing with renowned orchestras, including the Orchestre National de France, Berlin’s Radio Symphonic Orchestra and Sinfonia Varsovia, under the direction of such masters as Yehudi Menuhin, James Conlon, Ken-David Masur, François-Xavier Roth and Charles Dutoit. After producing two CDs released by Sony Classical, the Wanderer Trio began a new partnership with Harmonia Mundi in 1999. Since then, nine recordings have been released, entailing a wide range of works: trios by Chausson, Ravel, Haydn, Shostakovich, Saint-Saëns, Mendelssohn, Smetana, the complete piano trios of Schubert and Brahms, Schubert’s Trout Quintet, Hummel’s Quintet, Beethoven’s Triple Concerto conducted by James Conlon, and pieces of Liszt and Messiaen. With the Austrian baritone Wolfgang Holzmair, the Trio has also recorded an album of Beethoven’s, Haydn’s and Pleyel’s folk song arrangements (Cyprès Records) and a number of CDs with works by contemporary composers, including Thierry Escaich, Bruno Mantovani, F.M. Beyer and Marco Francescini. These recordings were acclaimed many times by critics and the Trio’s latest album, containing Mendelssohn’s works for piano trio has been hailed as the new reference by the New York Times. In 2012, the complete Beethoven piano trios will be released by Harmonia Mundi and an album of chamber works by Bruno Mantovani will be released soon on the Mirare label. Trio Wanderer’s 2012-2013 engagements include three concerts at London’s Wigmore Hall, performances at the Wien Musikverein, in Aachen where they will start a three year residency for the Accordate concert society, the Salzburg Festival and concerts in Denmark, Norway, Taiwan and Japan. The Wanderer Trio has won the prestigious Victoires de la musique award for Best Instrumental Ensemble of the Year three times (1997, 2000 and 2009).